I made these stuffed artichokes last night as we watched the US elections. Maíz (corn) is mixed with fresh herbs that are wonderfully aromatic. By adding a bay leaf to the water when you steam them, you’ll add another level of nice aroma. Just a glass of chablis can accompany this dish that’s suitable for company. If you want to add more protein, try serving it with some crab cakes that you prepare beforehand, keep in the fridge and then cook quickly on the skillet. 3 cups cornbread, finely crumbled. 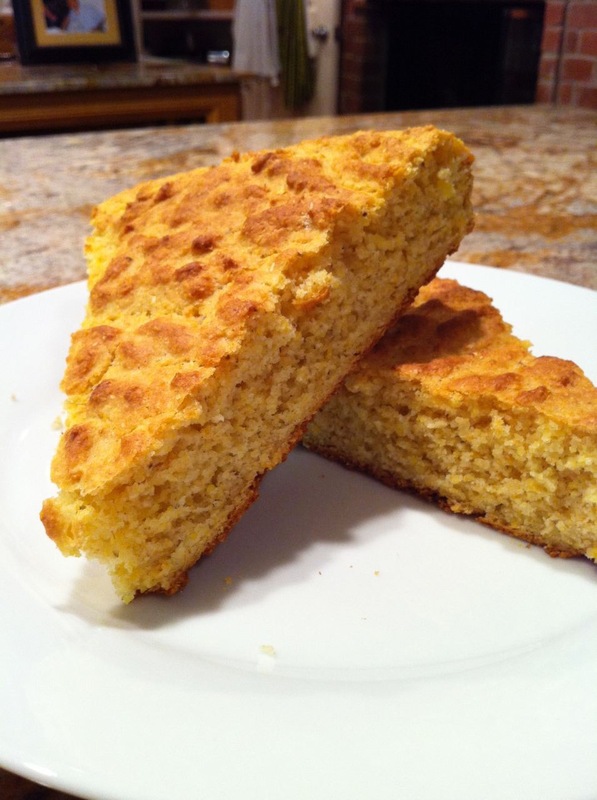 Use this cornbread recipe that has reduced fat and pops with flavor. Wash the artichokes, then cut off the bottom stem so that the base will rest flat on a plate (the stems are edible). Slice about 1” off the top of the artichoke and, with scissors, snip off the sharp, pointed end of the remaining leaves. Brush the cut ends with lemon juice to keep them from turning dark. Spread the leaves apart and remove the small center thin leaves that are usually purple on the edges. With a spoon, scoop out the little fibres that are resting on top of the artichoke bottoms. 2. Place the artichokes in a pot or saucepan and cover completely with water, then boil the artichokes for 30 to 45 minutes until the bottom end is soft when pierced with a fork. Place them face down on a colander to drain. Set aside. 3. Crumble the cornbread into pieces and place in a food processor, along with all of the herbs and the salt. Process until the crumbs are very fine and the herbs are finely minced and completely mixed with the crumbs. Add 1/3 cup vegetable or chicken stock and pulse once or twice to combine. The mixture will be moist but still granular. 4. Spoon the herbed cornbread generously in-between all of the leaves and place 1 or 2 Tablespoons in the center. 5. Place a bay leaf in the water of a steamer and steam the artichokes for about 20 or 30 minutes until they are completely heated through. When thoroughly heated, sprinkle the tops with paprika and serve immediately. 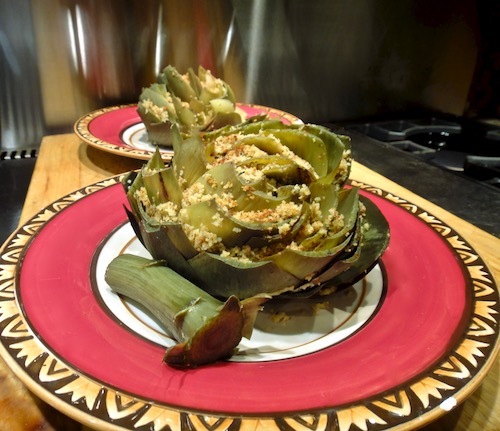 Leave a comment and let me know how you like these herbed stuffed artichokes.